Do you work hard to earn great reviews for your business? If so, you’re not alone. Most businesses strive to get as many five-star reviews as possible. And it’s not hard to imagine why. Before you buy something online, drive across town to a restaurant you’ve never tried, or download an app, what’s the first thing you do? You probably check the reviews. If they’re bad, you probably won’t purchase an item or try a new restaurant. But if they’re good, you’ll likely give it a try. So you should do everything in your power to try and get five-star reviews across the board and prevent any negative reviews, right? Actually, that shouldn’t be your goal. Believe it or not, earning perfect reviews isn’t critical for your business. In fact, negative reviews can actually help your business in ways you may have never expected. If you’ve put all of your focus on avoiding negative reviews, you’re going about reviews all wrong. You may find that hard to believe, but it’s true. Here’s why you need negative reviews and some of the ways that they can be beneficial for your business. Before the digital era, we all relied on our friends and families for testimonials. But now, we rely on so many other factors to make our final decisions about companies. 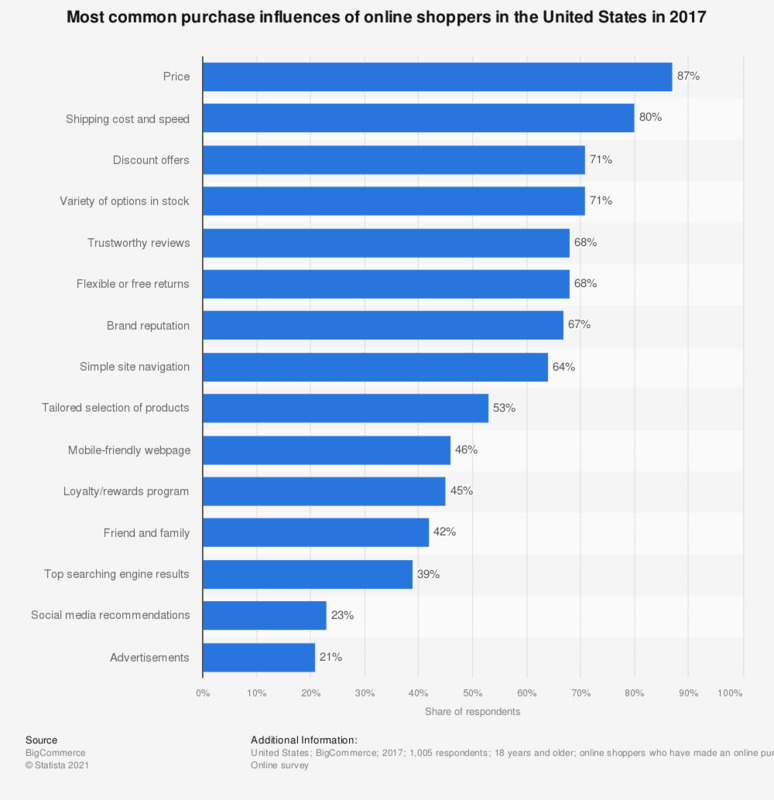 It appears that trustworthy reviews now have a bigger influence on online purchase decisions than family and friends do for 68% of US shoppers. Recommendations from friends and family influence only 42% of consumers. Instead, rewards programs, brand reputation, and trustworthy online reviews have taken the place of good, old-fashioned word-of-mouth recommendations. A 2017 study by Power Reviews once again confirms the growing consumer dependence on ratings and reviews. Today, 97% of consumers read product reviews before making a purchase decision. 89% of them consider online reviews to be an essential resource in the process. On the flip side, 85% of consumers look for negative reviews in order to make informed purchase decisions. And this number skyrockets to 91% among consumers from the ages of 18-29. Because bad reviews give customers a sense of the worst-case scenario. They want to know what can go wrong to understand just how much it will matter to them. Too many positive reviews can seem fake to some shoppers, so you have to watch out. But how do consumers determine if a review is truly authentic and trustworthy? BrightLocal’s study shows that Facebook and Yelp are the two most-trusted review sources for local searches. Google comes in third. Out of all these review platforms, Yelp seems to have the most strict rules and regulations. This explains the fact that the average review score on Yelp is 3.65, which is the lowest out of these platforms. The average reviews on the others major platforms are 4.42 on Facebook, 4.3 on Google, and 4.25 on Tripadvisor. Therefore, Yelp may be the most reliable place to gauge reviews. And these ratings matter for your bottom line. An extra rating star on Yelp translates into a 5% to 9% revenue growth, which is an impressive but dangerous correlation. Reviews really can make or break your brand’s growth. But on any platform, you will inevitably receive some negative reviews. So, how do you respond to them? You should start by coming up with a game plan. The way that a business treats a negative review can tell you a lot about them. Don’t panic. Don’t ignore them. Instead, embrace them. Some brands like Wendy’s are even using negative reviews as a chance to make a splash on social media and go viral. However you choose to embrace negative reviews, you need to come up with a game plan before you say anything back to your customers. But customers expect businesses to respond to their reviews quickly. 51.7% of consumers expect businesses to respond to their negative review within seven days. So if you do happen to receive a negative review, you need to act fast. Being aware of your customers’ complaints should be your number-one priority for customer service. The first thing you need to keep in mind is that not all negative reviews are valuable. There are two types of negative reviews. And then, there are the troll types who seek attention and potential monetary gain. Some people might want to take advantage of the leverage that leaving a bad review might give them by blackmailing you or threatening to leave a bad review if you don’t give them a refund. And you can’t insure your business against trolls. Constructive feedback, on the other hand, is a gold mine for any business. It is a form of valuable, direct, instructional feedback from the people who matter most. And a negative review will only stay negative forever if you ignore it and never address it. So having a game plan to respond to these complaints is what will set you apart from companies who choose to ignore them. Decide on a communication strategy that will match your brand identity and tone of voice. Try to keep it consistent across all review platforms. Zappos never fails to respond to negative customer reviews, and they give their responses a positive twist. Take a look at a recent response they gave to a complaint on their Facebook page. The brand offered to send the customer a new replacement pair, and they recommended that she keep or give away the shoes that don’t fit. It’s pretty hard to argue with an attitude like that. Depending on the personality of your brand, you can choose to be friendly and conversational like Zappos or more formal but tactful like Marriott. Whichever way you choose to go, make sure that you remain genuine. Don’t answer with a template. Take the time to actually investigate each issue and respond accordingly. You should think of each negative review as an opportunity to show your customers that you care. Believe it or not, bad reviews have the power to improve your conversion rates, too. If your business gets only positive reviews, consumers might question whether those reviews are legitimate or not. Not everyone will, but those who are a little bit more cautious might. And with so many fake and paid reviews circulating on almost every review platform, this is becoming a real issue. Amazon’s fake positive review problem has recently become huge. As the average rating has risen, the average review weight has taken a huge nosedive. There are even Facebook groups that incentivize people to write fake reviews of Amazon products. On the other hand, having a healthy mix of both positive and negative reviews will help build trust in your business more quickly. A study by Northwestern University’s Spiegel Research Center discovered that likelihood of someone purchasing a product with five reviews is 270% greater than a product with no reviews. That means having five reviews, whether good or bad, can increase your number of purchases by nearly four times. And a mixture of good and bad is helpful so that you don’t fall into the “too-good-to-be-true” category. So, what is a healthy mix of good and bad reviews? What amount of bad reviews will boost your conversion rates instead of driving customers away? Anywhere between 4.2 and 4.5 stars is an ideal average. More stars does not equal more sales. When your positive reviews appear with a few negative reviews, you reduce buyer skepticism. But you obviously you don’t want to end up with too low of an average. A lot of customers use rating filters to simplify their searches, so you may not even show up when they search for products if your average reviews are below four stars. If your ratings are low, don’t fret. It actually doesn’t take a lot to increase your ratings. A recent study of TripAdvisor found that one-third of the hotels were able to increase their rounded ratings by half a star or more within six months of their first management response. Customers actively seek authentic and trustworthy businesses. No business is perfect, so negative reviews will assure those who read them that the reviews are authentic. Negative reviews are a perfect stage for you to shine as a business with top-notch customer service. It is an opportunity to show that there are actual people behind your business. Customer service is not just about assisting a purchase. It’s about solving any problems that come up before, during, or after a purchase and preventing them from happening again. Poor customer service will cost your company big time. Tons of consumers have abandoned a business due to poor customer service. As you can see, this figure has grown over the last couple of years. And it’s only going to keep increasing. So customer service is still a huge deciding factor for customers making purchase decisions and for you retaining existing customers. According to numbers from Kingfisher Inc, acquiring a new customer is five times as expensive as retaining an existing customer. Responding to negative reviews will help you keep your current customers coming back for more. It’s a good idea to respond to all reviews — both good and bad. On the one hand, your negative reviews give your company a chance to show it’s human side. On the other, responding to positive reviews will help you show appreciation for your happy customers, whose reviews matter most in the long run. The biggest challenge to responding to every review is that you may receive an overwhelming quantity of reviews. Quite often, it requires a whole team of customer service heroes to handle reviews on all channels. And all of your customer service reps need to know how to respond well. Here are some essential tips to keep in mind when replying to negative reviews. 1. Get to the bottom of the issue. Always try to verify what the reviewer says by conducting a quick internal investigation with your staff. You always want to try to understand what happened. 2. Hold back your emotions and do not get defensive. Sometimes, the reviews will be unfair and even false. Remember to always stay respectful and factual in your response like Amazon in the example below. 3. Show genuine empathy. Sometimes, the only thing that a disappointed customer needs is a simple apology. When you respond to reviews with an honest apology, your customers will know that you truly care. 4. Take the problem offline. If you feel like the issue is escalating, it makes sense to continue the discussion privately rather than commenting back and forth. 5. Respect the rules. Many businesses offer discounts and coupons to make up for their mistakes, but some platforms consider this a violation of trust or even bribing. Like in the example above, email the coupon or discount instead of posting it on a social media site. Never forget to tell your side of the story to defend your brand, either. Bad reviews are not always your fault. But when a number of things add up to a negative customer experience, your business might suffer. If somebody were to falsely accuse you of a crime, you would do anything in your power to prove your innocence. When a review is simply untrue, you might need to do the same. Sometimes, you need to share your side of what really happened. That way, future customers who come across your page and see negative reviews can read your account of the story and make an informed decision for themselves about what really happened. When you can gracefully articulate the facts and show off the benefits of your business at the same time, you can take a negative situation and spin it into a positive one. When you satisfy your customers, you’ll encourage them to stay loyal to you. Answering each and every customer review is a must. But it’s even more important to actually solve your customers’ problems. Nothing is more disappointing than a regular “we apologize for any inconvenience caused” type of response with nothing but a bunch of meaningless words. That’s not helpful or satisfying. It’s annoying. And being timely with your detailed solution is also important. Data from HBR shows that brands that respond to customer issues quickly have more chances to retain customers. The quicker you respond, the more customers will be willing to pay for your products and services in the future. In this study, customers were willing to spend almost $20 more for a ticket from an airline that responded to their complaints in less than five minutes. That same study found that customers of wireless carriers who got their issues resolved with customer service reps were willing to pay $8 more for their wireless plans. But what is even more fascinating is that customers were willing to pay an extra $6 for wireless services from the brand even if the carrier didn’t solve their problems. Just getting a response was enough to make willing to pay a little bit more. Obviously, there are customer problems that you can’t resolve for a number of reasons. But this study shows that even a simple expression of empathy can go a long way in diffusing frustration and providing good customer service. Delta’s pizza party is a great example of how brands can provide good customer service through empathy. They ordered 600 pizzas for their passengers who experienced delays because of severe weather in Atlanta. Another benefit of responding to angry customers is engaging them in a conversation. Making a personal connection with a dissatisfied customer can make all the difference. When your customer service reps do this, it’s a good idea to have them sign their initials or names when responding. This way, customers will feel more comfortable following up on their issues later on. Many brands use this, including Burt’s Bees. Encourage customer service agents to add their names to tickets and responses for a personal touch. All in all, you should always think of negative feedback as a chance to improve. Customer satisfaction has never been more important than it is today. Around half of all startups fail. And that’s not just true about tech startups. That’s true of businesses in nearly every industry. Take a look at this 2017 graph from Failory. The highest failure rate occurs in the information industry where 63% of startups fail. But having a sound customer retention strategy can increase your odds of success, and review management is a big part of it. Treat every kind of feedback you receive as a gift. It is a free piece of information that you can use to improve and grow your business. There is no better way to know if your business does well than asking your customers. That’s why there are so many businesses carry out customer surveys every year. Big brands spend tons of resources on conducting customer satisfaction surveys even though customers often abandon them without finishing them. As you can see, it’s difficult to get customers to complete surveys. That means that getting voluntary feedback is invaluable. It can help you uncover and resolve key consumer pain points. This, in turn, can help your business grow. Their stock went from $4 per share in 2008 to $215 per share in 2017. Keep in mind that not every customer will bother to leave a negative review. However, the ones that do are probably not alone. There will be a lot of customers who feel the same way but never express their opinions. They just leave without you even knowing. It’s always good to show love to your unhappy customers and strive for a second chance with them. But that’s not the only way to use negative reviews for your business growth. If you dig deeper into those reviews, you will be able to find actual business ideas. This is especially true for digital businesses like SaaS or other web-based services. Many of these businesses utilize tools like UserVoice to bring customers into the product development process itself. When a customer is unhappy about certain aspects of the product, customer service agents encourage the user to submit a feature request in UserVoice. If the feature gets enough upvotes, it ends up on the product roadmap. No one can tell you how to improve your services or products better than your own customers, so never miss a chance to listen to what they have to say. For instance, Buffer used customer feedback to validate the idea of having a video upload feature. This idea came from a customer request. Buffer soon implemented this feature, and it was a success in terms of customer collaboration. Don’t view all of your negative reviews as threats. Strive to learn from them and use them to improve as a company. Most businesses do everything they can to avoid negative reviews. And in many ways, this makes sense. But not all negative reviews are bad. In fact, they can be helpful in several ways. Bad reviews help build trust. Today, buying fake reviews is as easy as getting any other service, which makes it difficult for shoppers to identify businesses with trustworthy ratings. Negative reviews create a healthy balance and help shoppers see that your public reviews are trustworthy. Ultimately, they’ll trust your business more because of them. Negative feedback is also a gold mine of opportunity. But you need a game plan before you respond to a customer. When it comes to customer interactions, do you want to be casual, formal, or somewhere in the middle? You should decide this before you begin responding. Customer complaints are a powerful tool to uncover internal problems on time and fix them before they go out of control. For this reason, they can help to boost your conversion rates. So, it is important to monitor all review platforms regularly. This feedback provides invaluable insights into customer satisfaction, which would otherwise require more effort and resources. It also provides a chance to showcase your customer care excellence and your human side. Be empathetic with reviews and apologize when you should. You shouldn’t ignore any reviews whether they’re positive or negative. Answering your customers’ feedback promptly and consistently translates into actual sales increases. This means that every review that remains unanswered is a lost opportunity to retain existing customers and attract new prospects. You also need to address reviews that aren’t true. You need to defend your brand against false claims. In most cases, that’s better than ignoring them. When you satisfy unhappy customers, you’ll be encouraging brand loyalty. And negative feedback is simply an opportunity to improve overall. But never forget to treat your happy customers with as much care and attention as the ones who complain. Happy customers are the best marketing. And it’s a free opportunity. Each review is a free piece of information that you can use to grow your business. Treat each one as a gift. In what ways have negative reviews benefited your business?